Nationally respected American watercolor artist, author, educator, juror… all describe the many contributions of Jeanne Dobie to the contemporary art world. Jeanne Dobie was a Juror of Awards for the 2014 and the 2007 American Watercolor Society International Exhibitions, NY, and a Juror of Selection for A.W.S. International Exhibitions 2004, 2001, 1995; the National Watercolor Society International Exhibitions, 2006, 1997, plus other major U.S. exhibitions for three decades. Medals and awards have been plentiful for Dobie's paintings, including the High Winds Medal, from the American Watercolor Society. The medal winning painting, "Three Bretonnes", was purchased by the Frye Museum of Art, Seattle, WA. for their collection. Other awards are listed under the paintings shown throughout the website. 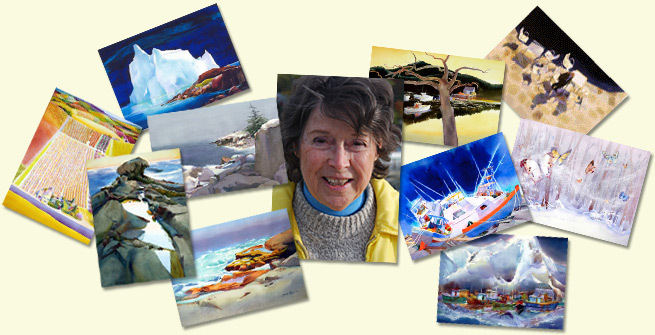 Dobie's work has been featured on covers and in articles in American Artist, Watercolor, The Artist's Magazine, and Watercolor Artist, (Click here to read the Watercolor article), and in European publications, Palet Magazine, Netherlands, and L Art de L'Aquarelle, France, which showcased 16 International Artists. Click here to read the article. "MAKING COLOR SING", Jeanne's well-known book, is distributed internationally in English, French, and Chinese (China only), and newly published in a Russian Edition. Watercolor Magazine 2006 recognized Jeanne Dobie as one of the "20 Great Teachers", and again with an "Artist-To-Artist" interview, 2008, for pioneering her fresh color/design approaches. Educated at the Philadelphia Museum School of Art (now the University of Arts), she later served on the faculty of Moore College of Art, Philadelphia, PA.
To learn about Jeanne's color approaches and working methods, click here (PDF 500kb). For another interview on the Creative Catalyst Productions website - click here (PDF 1.1MB). Watch a preview of one of Jeanne's popular lessons "Turning Errors into Assets". For three decades, Jeanne Dobie has shared her ideas and unique approaches to color and design throughout the U.S. and overseas in 17 countries. "MAKING COLOR SING" DVD 7 Lesson Workshop Set is SOLD OUT! For artists who own my DVD Workshop Set, enjoy it and share it with another artist. For her achievements, Jeanne Dobie was named to the Pennsylvania Honor Roll of Women.